Our best wishes for a happy Christmas from the Comtaste Consulting Team. He missed the italian track :) that should happen on 23th of January in Milan. Serge Jespers, James Ward, Enrique Duvos and Andrew Shorten will be the special guest of the eventand they'll talk about Flex 3, AIR and BlazeDS. I'm glad to announce a new project's on which Comtaste is working on : YuBuk. 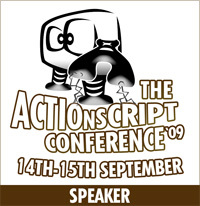 Flex with cross scripting techniques, Google MAPS, AJAX with Scriptacolous and Prototype libraries are some of the technologies involved in this project. It was very fun to see how a simple web based old style application in some months turned into a real rich internet application. We have published a Case Study on our site, where you can have more details. Yubuk is a platform which is accessible on the internet and on mobile terminals for all those who love Italy for its enchanting locations, for its excellent cuisine and exceptional hotels. 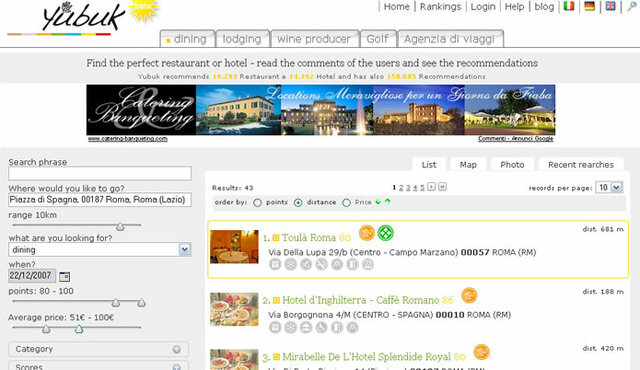 Yubuk.com contains information on ten of the “coolest” locations in Italy, information which is accessible to all and to which all the users can contribute and create, modify or comment. This is one of the best and most useful mash up Rich Internet Application we've worked on. In fact to be able to conceive new and richer modes of fruition, the technological choice has also required a careful analysis of the languages and the standards of highest profile. The increase of the visits to the site has brought (and will continue to bring more) an increase of traffic and load on the infrastructure web server. To avoid problems of instability or delays on the site, it was decided to separate the principle applications of the site on two different servers, Apache and PHP 5 was installed on the first, and instead MySOL is present on the second. Both applications were configured in order to obtain the best performance in relation to the load. To improve the entire infrastructure of the site, a course or restructuring of the code was undertaken to exploit the potential offered by a powerful and famous PHP framework such as Zend. Security, reliability, modulation and integration are just some of the benefits that such a choice entails. The Zend Framework uses the latest development technology to be able to produce flexible and extendible code, using the standard design pattern for the web applications, the model-view-controller (MVC). Furthermore, in the framework, there are also functions present among which internationalization and localization, authentication, session management, search, cache and integration with external APIs. The activities on Yubuk are up and running, with a continuous assistance for the improvement and evolution of the service. Important goals have already been achieved, measurable especially in terms of the improvement of the user experience and the ranking of the portal. Heard the following rumors about a new tool , Adobe Bordeaux (via Beedigital), to create Flash contents without programming with Actionscritp 3 language. With Flash Player 9 Update 3, the FLVPlayback component is updated to add support for the high-definition MPEG-4 video formats that utilize industry standard H.264 encoding. These formats include MP4, M4A, MOV, MP4V, 3GP, and 3G2. They do not include protected MP4 files, though, such as those downloaded from iTunes or digitally encrypted by FairPlay. Consequently, the FLVPlayback component is no longer restricted to playing FLV files. Note: The ActionScript 2.0 FLVPlayback component also supports MPEG-4 video formats that utilize H.264 encoding, beginning with Flash Player 9 Update 3. For both ActionScript 3.0 and ActionScript 2.0, you need to ensure that you are working with an updated FLVPlayback component in order to use H.264 video files in your project. Now, in my experience the FLVPlayback does not accept the .mp4 extension. Plus the Flash Player used to test files in Flash CS3 (the euthoring) is the version 9,0,45,0 which does not support h.264. My conclusion is that we have to wait until a new update of the FLVPlayback component or the Flash CS3 IDE will come out. It's been a long time ago when I decided to switch to a Mac. Unfortunately at this moment I have not updated my PC against a Mac for some reasons that are, in my opinion, very logical. My plan was to buy a new Mac Book Pro 15'' for middle November 2007. As you probably know, on January 2008 there will be the MacWorld 2008 event where we're pretty sure that new stuff will come out. 2. iPhone does not support UMTS. For Italy and Europe in general this is a tremendous lack ! 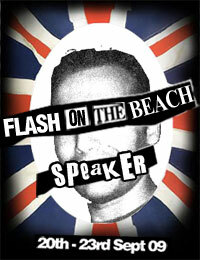 I've waited for some days before officially announcing that I'm glad to be one of the speaker of the FITC 2008 in Amsterdam. The speakers and presentations announced so far are cool so I think this is another great european conference you cannot miss (hey @Peter and @Koen , we'lla have a lot of fun in Amsterdam). Flex is the quickest and most effective technology for the creation of Rich Internet Applications for the Web. Its extensive library of components and totally customizable framework, combined with the ubiquity of Flash Player, has guaranteed its success. The ecosystem of products that rotate around Flex 2 and Flex 3 is really broad. Flex Builder, Flex SDK, and Charting Components are all essential parts of the technology that fit the different requirements of web development. This enormous set of possibilities can easily lead to overload for developers like you. There's just too much to learn and too many potential places to go when you hit a brick wall. Wouldn't it be nice to have a library of solutions to solve these problems quickly and easily? In this session we'll face problems and provides solutions that can be applied to any project, from the most simple to the most complex. This is a beginner to intermediate session for Flex developers as well as Flash developers. Basic knowledge of Actionscript 3 and MXML is a plus. What attendees will take from it? Learn how to improve your daily Flex development and your productivity using the Flex 3 SDK, the ecosystem of Flex Open Source libraries and development tools. If you compare thi graph to the one that uses "Adobe Flex" as words, you can see how they look similar. Have also a look at the growth of Flex Data Services jobs. Cool !! For what concerns our experiences it's a great momentum for Flex Data Services (or Livecycle Data Services) in Europe. We are making a lot of interesting consulting activities on this stuff (FDS, Flex, LCDS) and we receive a lot of requests !